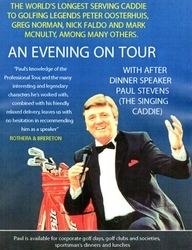 Paul has toured around the world, met and worked for many top golfing legends. Even in retirement is still the longest serving tour caddie to date, amassing 35 years on the tour. There’s two things Paul loves, Entertaining and Caddying. The Golfing World recently spent time with Paul Stevens, who has carried the bag for the likes of Sir Nick Faldo, Greg Norman and Tom Watson as well as supporting The Beatles on stage at the famous Cavern Club in Liverpool. Although he retired from the Tour as a caddie, he can look back on his career with pride, and historically say ‘I was there!’ when certain golfing feats were recorded, an example of many was, during the Ryder Cup at Muirfield 1973, against Arnold Palmer and Jack Nicklaus Paul correctly overruled his player to select the club for the very first hole in one in Ryder Cup history. Paul has spent several years since retiring from the tour, entertaining and After-Dinner speaking at many functions at golf clubs and events. Giving interesting facts and funny situations from his experiences on the Golf Tour. Paul finds his After-dinner speaking very rewarding and enjoyable and has spent many wonderful evenings at events that he has been booked for. Paul began caddying at the age 12, at Rochdale Golf Club in, primarily as a weekend and summer holiday job to earn some spending money. 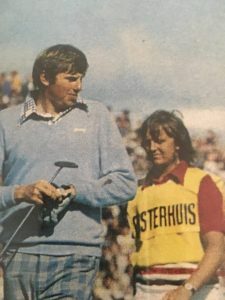 Paul’s talent as a singer soon took pri ority in his late teens, and the caddying would have to wait to re-emerge some years later when he was accompanying his cousin at a professional tournament. One of the professionals had been let down by his caddie not showing for the events, and Paul was asked if he could accommodate the young professional. Paul informed the professional that he hadn’t caddied for some time, but was willing to help. After the round the professional commented on how impressed he was with his ability as a caddie and asked ”when was the last time you caddied”, Paul replied ”twelve years ago”, that’s where it all took off, the following year he was standing on the 18th green at royal Lytham St Anne’s, on the final round of the Open with the top two professionals in the field, Gary Player and Peter Oosterhuis. 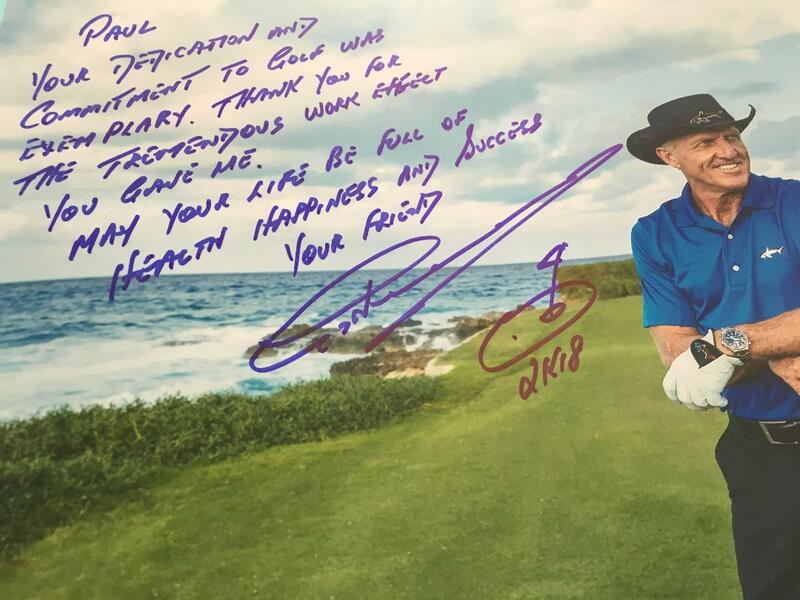 He has caddied for such famous players as the legendary Sam Snead, Christy 0′ Connor Snr., Ben Crenshaw U.S. Masters’ Champion 1984 and 1995; Hubert Green U.S. Open Champion 1977; Bill Rogers Open Champion 1981, Curtis Strange U.S. Open Champion 1988 and 1989, Sandy Lyle Open Champion 1985 and U.S. Masters Champion 1988 and has won the Australian Open in 1984 with Tom Watson (3 times Open Champion, Masters and U.S. Open Champion at Royal Melbourne, one of the finest courses in the world. 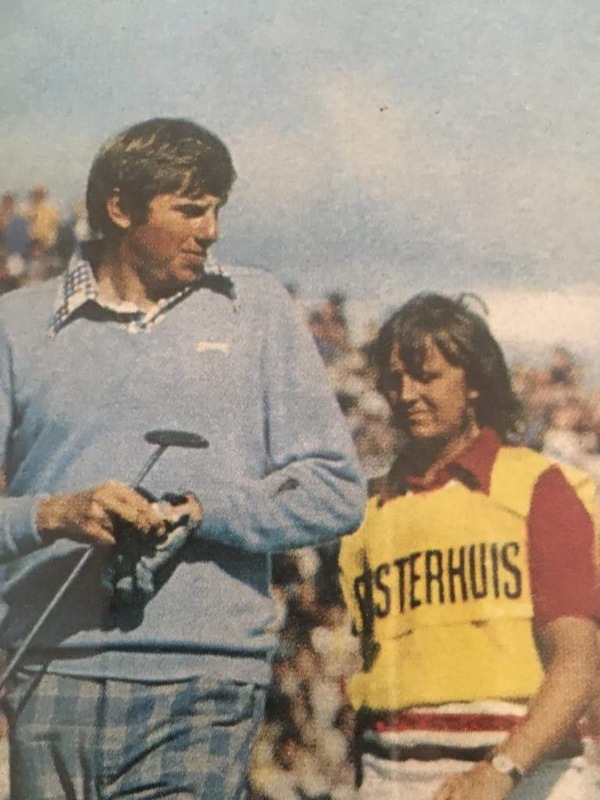 He has been the regular caddy for Peter Oosterhuis in 1974, leading money winner and 2nd. in Open Championship; Greg Norman in 1979/80; Nick Faldo in 1986, and also for Mark McNulty,2nd. in the Open Championship 1990. with whom he has won 3 German Opens and the 1987 British Masters, which he also won again with Christy O’Connor Junior in 1992.